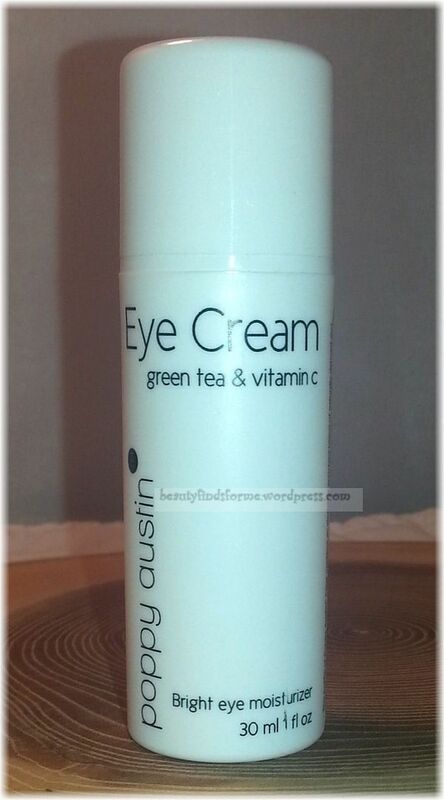 I received Poppy Austin Revitalizing Eye Cream in return for my honest and unbiased review from Tomoson. Poppy Austin Revitalizing Eye Cream is a highly concentrated blend of naturally derived and organic ingredients, designed to restore a youthful glow around the eye area and directly tackle dark circles and puffiness. 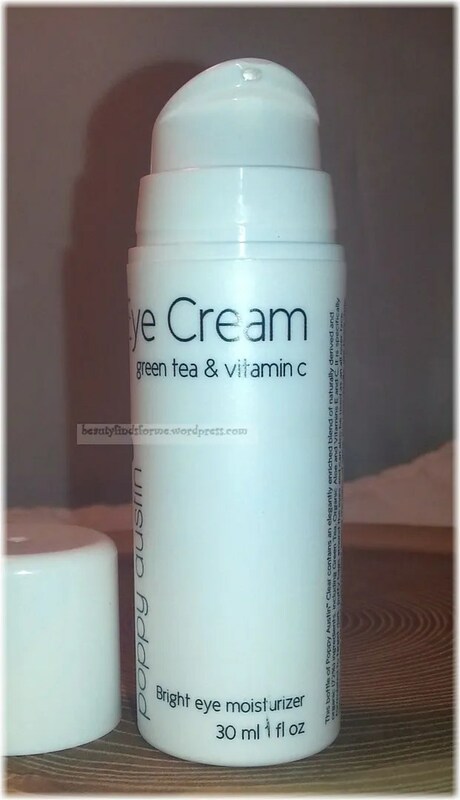 A multi-purpose and lightweight organic eye cream, it can also be used as an all over face lotion, absorbing quickly into the skin without clogging pores. It is suitable for all skin types, including sensitive skin, and is naturally free from silicones, parabens, additives, fillers and alcohol. Key ingredients include our luxurious organic Aloe, Grapeseed Oil, organic Jojoba Oil, Green Tea, Lemon Citrus, organic Rosehip Oil, Vitamins E and C and many other sumptuous moisturizers and natural antioxidants. Poppy Austin Revitalizing Eye Cream is a smooth, thick, creamy white cream, that has a slight medical herbal scent to it, but fades quickly. It is fast absorbing, not sticky or oily, and leaves my eye area well moisturized and hydrated. One pump is enough to do both eye areas, and I found that it leaves a cooling sensation on my eye area. 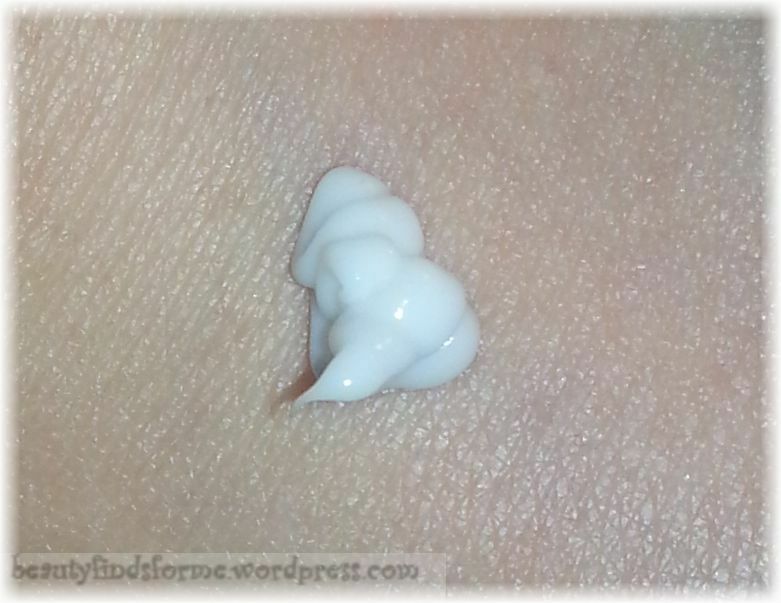 I did notice that my fine lines around my eyes looked less visible and plumped up when I used this eye cream and the puffiness under my eyes had been reduced. I like that this is in a 100% recycled airless pump container and not a tube. This eye cream contains 72% organic and natural ingredients and you can also use this on your face, not just your eye area. I have not yet tried it elsewhere, as I have other facial creams, but if I am doing short travels, this might be handy just to have one cream to do your eyes and your face. This is, however, a really nice eye cream that does refresh and revitalize my eye area. Vitamin E ~ The antioxidants of all antioxidants ~ prevents free radical formation, protects the upper skin layer from initial harmful UV radiation and prevents the deterioration of fats in your cell membranes. Grapeseed Oil ~ A easily absorbed, light and gentle oil, rich in beta-carotene and vitamin C, vitamin D and vitamin E. A concentration of essential fatty acids help with the reduction and prevention of wrinkles. Glycolic Acid ~ AHA, an exfoliator which removes top layer of dead skin cells, exposing new skin. It also lightens hyper-pigmentation from sun damage or aging. Tamanu Oil ~ This oil helps heal skin by speeding up wound healing and encouraging new skin cell formations. Squalene ~ Squalane has the ability to penetrate the skin quickly and completely, which makes it valuable in skincare products, as it is a powerful antioxidant, UV damage preventative, prevents hyper-pigmentation due to age, promotes cell growth. Apple Extract ~ Apple extract is acidic and vitamin rich and helps with anti-aging, anti-ance and brightening skin tone. There are no silicones, parabens, additives, fillers or alcohol. Poppy Austin has promos you can use on Amazon.com so you can save on shipping and get a discount. Get 10% OFF and FREE SHIPPING when you order two (2) or more bottles of Poppy Austin® Best Eye Cream. Enter code PA1U30TV at checkout. Purchase any 3 products from Poppy Austin® and get FREE SHIPPING plus $5 OFF your ENTIRE order. Enter code PAO3R105 at checkout. Purchase any 4 products from Poppy Austin® and get FREE SHIPPING plus $6.25 OFF your ENTIRE order. Enter code PAO3R106 at checkout. Purchase any 5 products from Poppy Austin® and get FREE SHIPPING plus $7.50 OFF your ENTIRE order. Enter code PAO3R107 at checkout. Purchase any 6 products from Poppy Austin® and get FREE SHIPPING plus $8.75 OFF your ENTIRE order. Enter code PAO3R108 at checkout. Purchase any 8 products from Poppy Austin® and get FREE SHIPPING plus $11.25 OFF your ENTIRE order. Enter code PAO3R111 at checkout. Save 20% on Poppy Austin® Vitamin C Serum when you purchase 1 or more of ANY product offered by PRIME Originals. Enter code PAVCAM09 at checkout. Unboxing February 2015 Beauteque Bag! This product does not help your eye bags or darkness around the eyes. It is not a bad moisturizer but is not an answer to eye bags or darkness around the eyes. yes, I found it to help with puffiness and moisturizing, as I wrote in the review.